Salty Rentals offers luxury golf cart and beach bike rentals for the best price in town ! You can pick up your golf cart or bike rental and ride straight onto the beach in style ! We have new 3 speed Electra Beach Cruiser bikes for adults and kids. Salty Rentals has 2 convenient locations. Beachside (Salty Mermaid Oceanfront Hotel) for rentals and mainland (Dixie Freeway) for sales and service. We can also deliver your golf cart right to your location ! We provide sales and service to New Smyrna Beach, Port Orange and Daytona Beach areas. 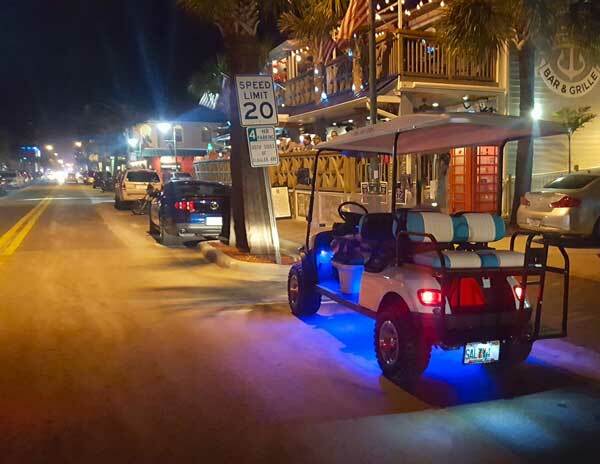 And you can keep your golf cart rental or bike, to cruise around New Smyrna Beach, as long as you like! Golf cart, beach bike and electric bike rentals are all available 7 days a week. NOW OFFERING FLAUNT ELECTRIC BIKES ! Pricing varies for 4 or 6 passenger golf cart. NEW Electra Beach Cruisers with bikes for kids now available !